The Outer Barcoo Interpretive Centre, a museum depicting the evolution of nature from 100 million years ago to the present. The feature attraction is a life-sized replica model of Isisfordia Duncani, who lived around 98 million years ago and was the evolutionary ancestor of all crocodilians that live on earth today. The Bulldog fish was also found in the area dating back 100 million years ago. There are displays of local fauna, flora, reptiles, birds and fossils that have lived in this region, as well as formation of the Great Artesian Basin and general history of the Isisford area. An audio-visual presentation portrays life in the Isisford area since settlement. 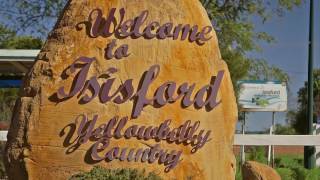 The film depicts Isisford as being 'the middle of everywhere'. The building also houses 60 seat theatrette, cafeteria, local arts and craft displays.